The Xfinity Series field making pit stops at Dover. 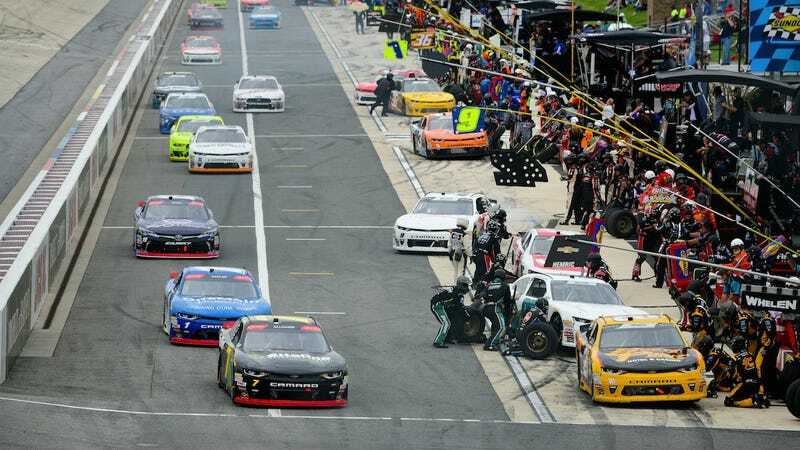 Police were called to Dover International Speedway on Friday morning after being called about a fight breaking out in the JP Motorsports garage. After a heated argument, the team’s co-owner Jerry Hattaway was taken to Bayhealth Kent General Hospital to treat his broken jaw, and crew member Lawrence Hayden was escorted to jail. According to ESPN, Hayden has been indefinitely suspended from NASCAR. He was released on a $500 bond after being taken in on the grounds of second-degree assault, a Class D felony. The incident started as a conversation about Hayden’s employment with the team before it quickly escalated into swapping blows. Motorsport.com reports that their altercation was so heated that it spilled over into the NASCAR Truck series garage before anyone was able to put a stop to it. NASCAR has declined to comment further on the situation, only noting that they plan to keep working with local law enforcement and that Hayden is definitely not coming back to the series. It’s JP Motorsports’ first year as an Xfinity team, with Josh Bilicki and Stephen Leicht piloting Nos. 45 and 55, respectively. It’s not a great way to kick off the year—but hopefully that’s the last rowdy crew member they’ll have to deal with. Correction: This story originally featured a photo that showed the Team Penske No. 22 Xfinity car, which was not involved in the altercation. It has been changed to show the whole field instead.